Verbal Reasoning– The verbal section now includes two new sentence completion types: sentence equivalence questions, for which test takers must identify two correct answers to receive credit; and text completion questions, some involving passages of several sentences and requiring test takers to fill in up to three blanks. Reading comprehension questions may now have more than one correct answer. Some reading questions will involve selecting individual sentences with passages. Quantitative Reasoning– As in the past, this section contains standard multiple-choice questions, as well as quantitative comparison questions. 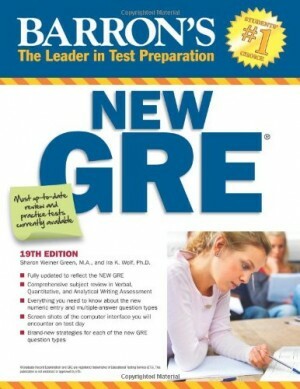 There are two new question types: multiple-choice questions that have more than one correct answer choice, each of which has to be selected, and numeric entry questions, which are the only questions on the test for which no answer choices are provided.Barron’s new GRE manual offers intensive practice and review for all question types plus a diagnostic test and two full-length model GREs with answer keys and explanations for all questions answered. The authors also present a test overview and valuable chapters on test-taking tactics.